Called the MetroDecker, the stainless steel framed bus is being launched at 10.5m long in two door format to appeal to the London market. 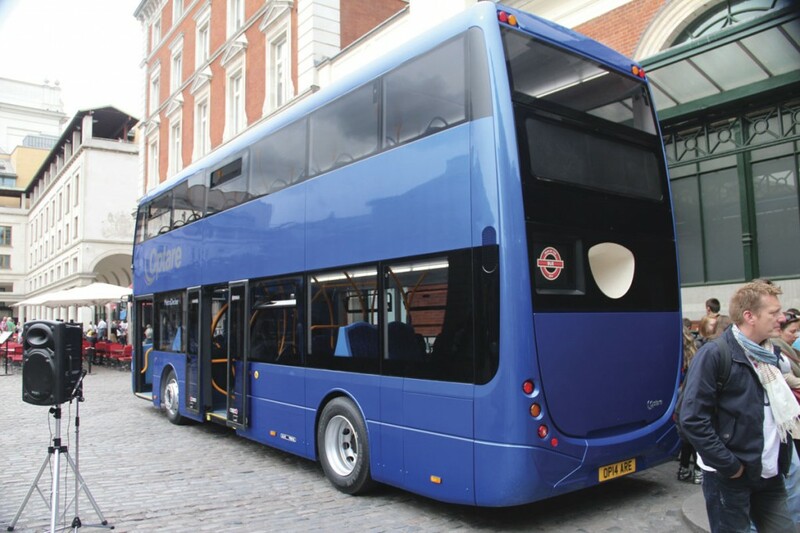 The first example was finished in metallic blue rather than the red you might have expected as the bus will shortly begin a demonstration tour spending a week each with a variety of London operators. Next will come the single door and open top formats in the fourth quarter of the year. 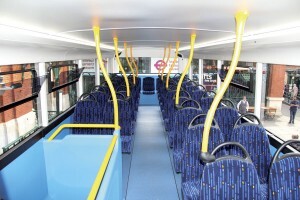 The longer variant is expected to be 11.1m long with one additional row of seats. In the second quarter of 2015 a hybrid model will be made available followed in the fourth quarter by a full electric EV. 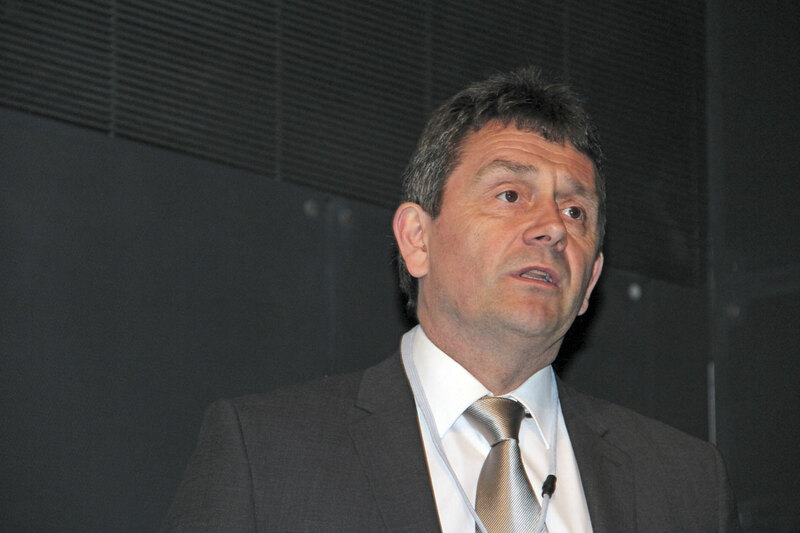 Glenn Saint said that for London there would be a full hybrid with battery storage and a zero emissions capability, though which hybrid systems supplier they would use had yet to be finalised. For outside London, mild and flywheel type hybrids would be introduced. 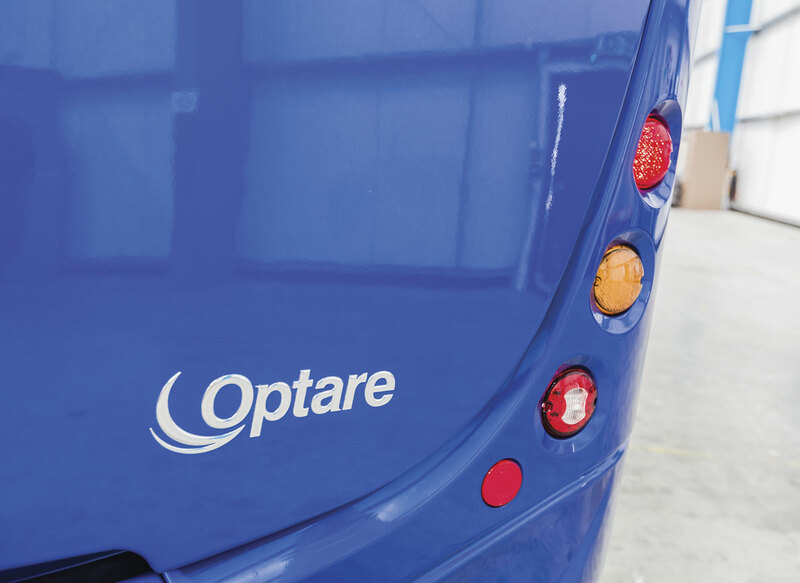 Optare’s strategy is to be market driven and target by potential sales volume the models it develops, hence commencing with London. The body will not be offered for mounting on other chassis though a rolling chassis version is to be produced for supply to other markets worldwide, with whatever driveline technology is appropriate. 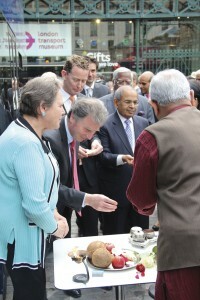 India was mentioned as one market in which it would be offered. Depending on who you asked, there were either no immediate plans for a tri-axle version or a tri-axle was another project in the queue. 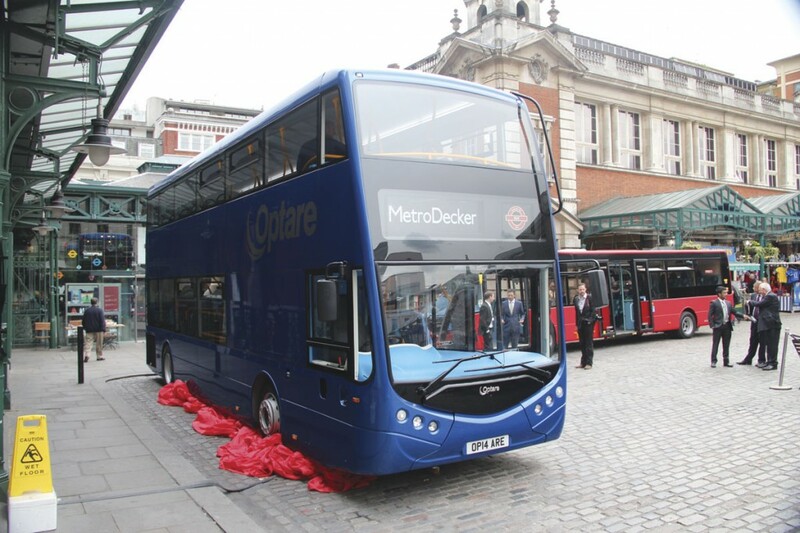 The MetroDecker title is not a hark back to the products of MCW, such as the MetroRider, to which Optare acquired the intellectual property rights many years ago, but to a new generation of London focused products that began with the MetroCity development of the Versa. 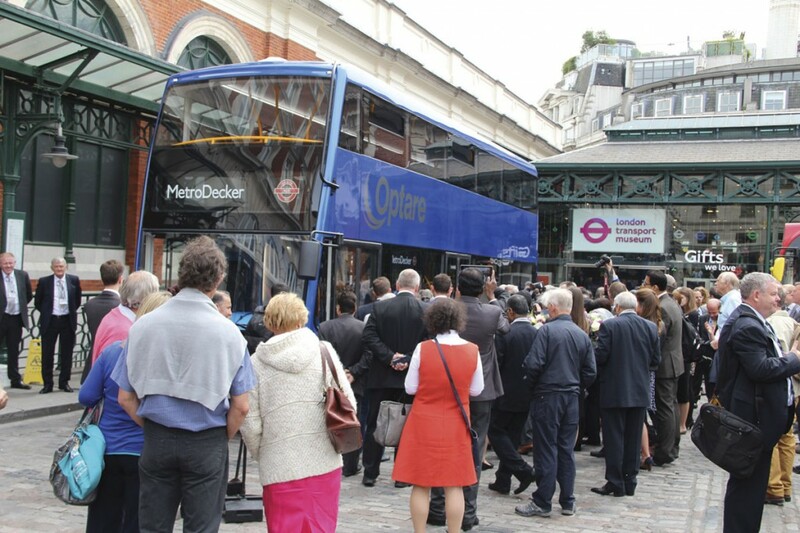 An example of a MetroCity EV from a batch of four being used by London United on the H98 was displayed alongside the MetroDecker at the launch. Externally, nothing gave away the fact that it was a full electric. The launch itself was unusual. 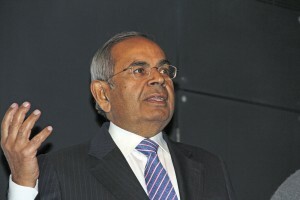 After the conventional presentation in the London Transport Museum at Covent Garden, Gopichand P Hinduja, Co-Chairman of the Hinduja Group, which owns 75% of Optare’s shares, enthusiastically expressed his support for Optare, indeed his presence there was in itself a strong expression of his commitment. It was a rare case of the speech he delivered being even more enthusiastic and positive than the press release. The press conference was followed by an unveiling outside, after which it turned into a media circus, with Transport Minister, Baroness Kramer, Tory MP Oliver Letwin, G.P.Hinduja and senior members of the Hinduja team, various ambassadors and the Optare management team lining up alongside the new bus while tourists took selfies of themselves in front of it and an Indian man performed a ritual culminating in the smashing of coconuts. 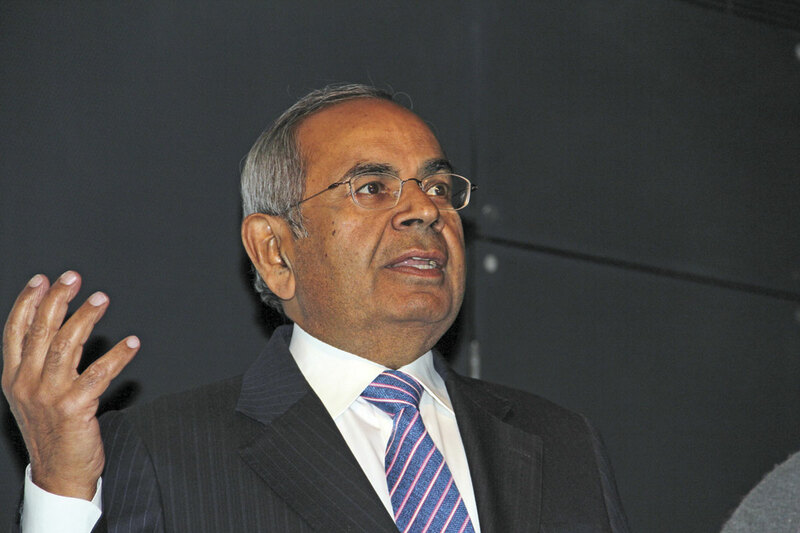 All of this while Indian television reporters, keen to ask G.P Hinduja questions about the Indian economy, busied a throng of cameramen. I wonder what journalists who had flown in from Europe and as far afield as Australia made of it all? When the main party left for an excellent Indian buffet at a restaurant round the corner, we got the chance to take pictures and have a closer look at the bus in the company of Optare Chairman, John Fickling; Chief Technical Officer, Glenn Saint; Tim Hampshire, who was responsible for leading the design team; and UK Sales Director, John Horn, who contrary to what you may have heard, is not retiring from the industry. Together they explained the finer points of the bus and answered all the points we raised. 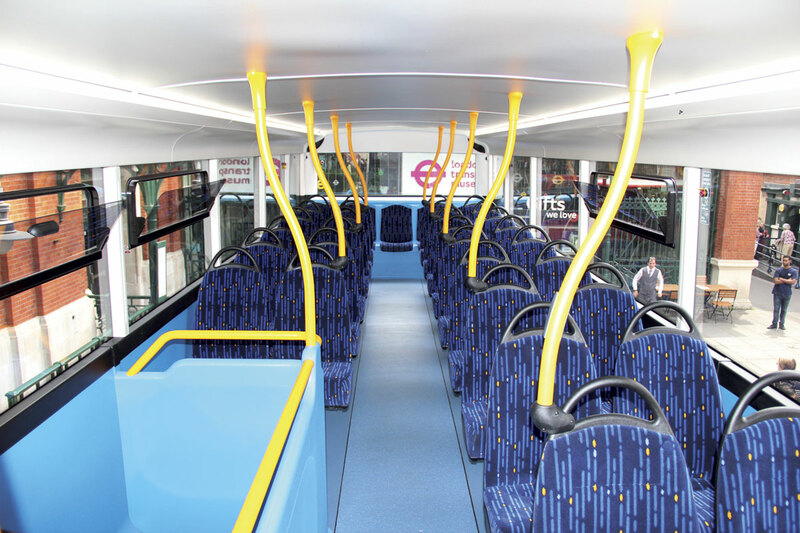 There was no direct consultation on the MetroDecker’s features with members of the public, but notice was taken of the findings of research undertaken by operators such as trentbarton and Blazefield who have sought the views of their passengers. Explaining the concept behind the MetroDecker, we were told that the aim was to deliver class leading fuel economy, at a cost competitive price, offering improved operational and maintenance access and also delivering reduced whole life cost. 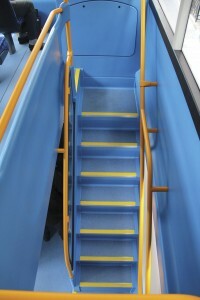 The vehicle will provide a common platform for both the double deck and a future single deck design. 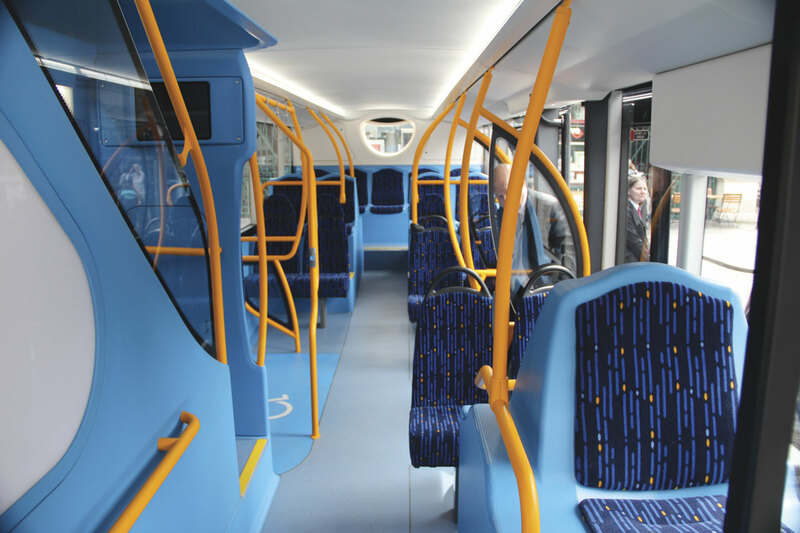 Key to achieving these aims was the reduction of weight, with the tough target of meeting TfL’s specification and keeping the double decker under 10 tonnes successfully met. The goal has been achieved through a variety of measures. 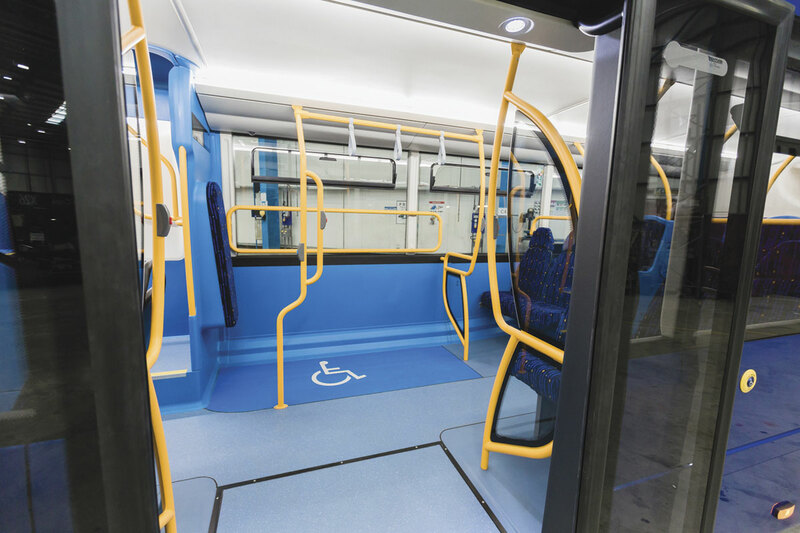 There is no separate chassis beneath the bus; it has a fully integral tubular 1:4003 stainless steel structure that absorbs all of the stresses. Minimising the mass has been achieved in several ways. 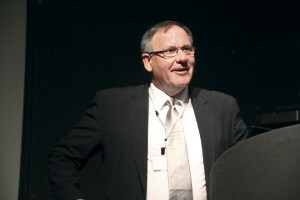 Glenn Saint told journalists that it was a combination of: reducing redundancy, by which he meant avoiding the incorporation of parts that served no useful purpose and designing the parts that were necessary in a manner that enabled them to do several jobs; optimising the structure, to create a strong frame without extraneous metal; and finally, using advanced composite materials, which performed the required task but without creating a weight penalty. Weight and fuel has been saved by moving to the 5.1-litre Mercedes-Benz engine, of which more later. The lighter weight is one thing and the more efficient generation of sufficient power with consequentially reduced fuel usage is another. 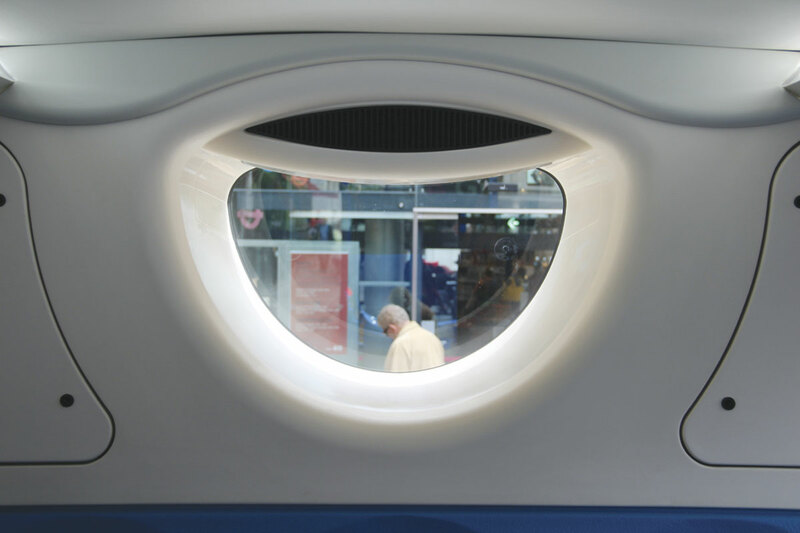 Created in house, rather than by design consultants, the look of the MetroDecker echoes that of the MetroCity, with the same frontal aspect and similar lower rear styling, including a rounded engine bay door. As Wrightbus have done, Optare have gone for shallower upper deck windows to reduce weight, though this is visually less obvious than it has appeared on the few Gemini 3s I have seen to date. The glass used is 4mm thick, though 3mm could be used without impairing the structural integrity of the design. On the offside, a wide T section maximises the operators opportunity to sell advertising space. The main body side panels on the upper deck are foam backed GRP sections. On the demonstration bus the roof was made of aluminium but production versions will feature GRP. An aspect of the design pointed out was that the second door is slightly further forward than on most other designs. 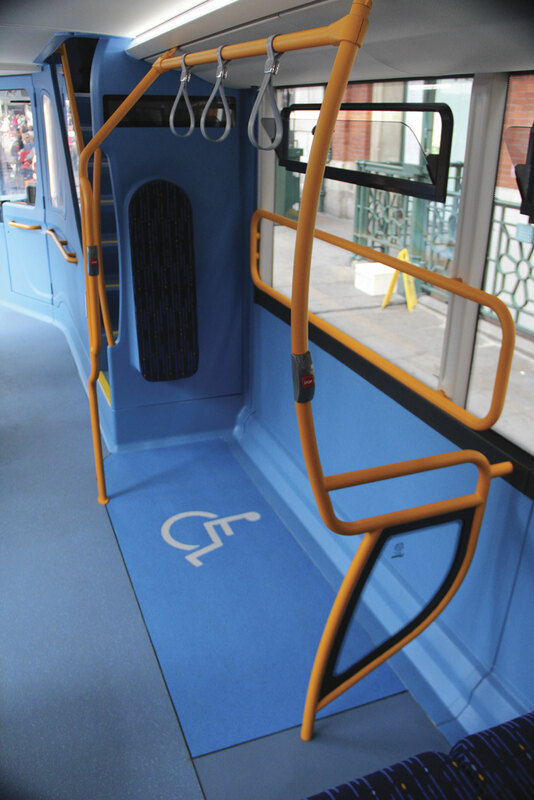 This is in order to allow a wheelchair passenger to get directly into the wheelchair bay to the rear of the staircase more easily. The backboard is built into the staircase structure. 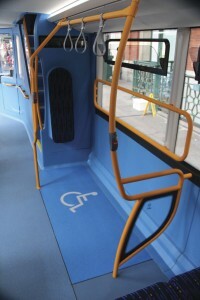 When not given over to a wheelchair user, the 2,030mm long area will permit multiple buggy occupancy. The door units themselves are fully glazed Ventura units opening inwards at the front, and sliding to the sides at the centre. Rural operators will welcome the fact that the MetroDecker has a gasket glazed one piece windscreen rather than a bonded one, though the side window glazing is bonded in place. I understand a quick release system is an option. The look of the interior is very straightforward and uncomplicated with nothing unnecessary. On the launch bus the predominantly blue lower mouldings contrasted with bright yellow curved handrails and stanchions and white ceiling, cove and window pillar cappings. 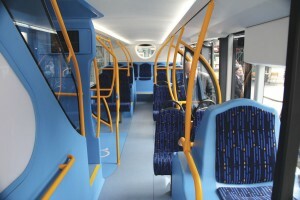 To TfL specification, the capacity is 63 seated passengers and 36 standees, giving a total of 99. The seating split is 41 on the upper deck and 22 on the lower. 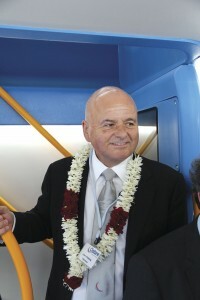 The 36 standee figure is an artificial one, favoured by TfL. 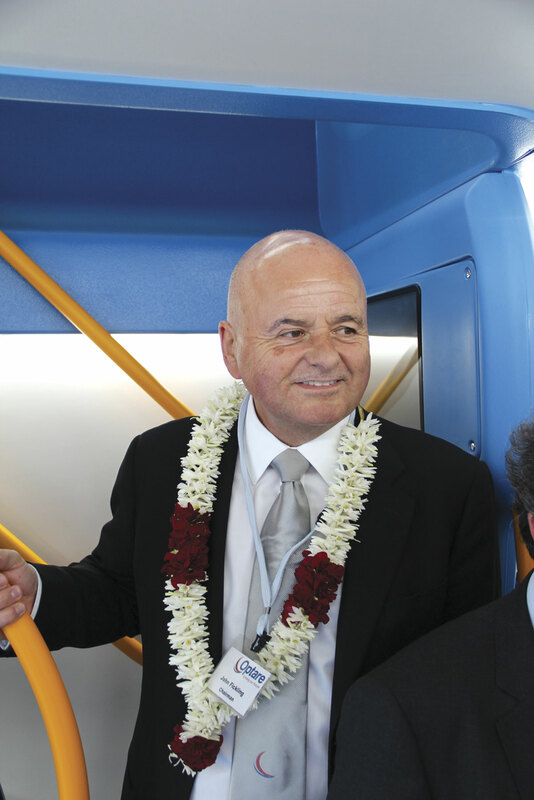 Glenn Saint said that with the low weight it would have been possible to accommodate up to 120 passengers, which would have given a 57 standee capacity. Tim Hampshire explained that they could have opted to install an ultra lightweight seat to further reduce the weight but as it was clear that it was Esteban Civic V2 seats that operators would specify anyway, it seemed sensible to equip it with them. Sitting on the upper deck he told me that those on the nearside were installed to TfL requirements, while those on the offside were to a slightly more generous pitch. Heating uses an Eberspacher fully automatic integrated heating and air conditioning system with a thermostatically controlled blown, warm air heating and venting system with a top deck chilling capability. This is integrated in the system mounted beneath the top deck rear seats and means there is no need for a separate unit to intrude within the space over the stairwell. A separate system gives the driver control of a system for the screen, his face and the foot well vents. Hopper windows were also fitted on the launch bus and I believe there are other options in this respect. The cab, which complies with the ergonomic strictures of ISO 16121, is a spacious one equipped with an adjustable Chapman driver’s seat. 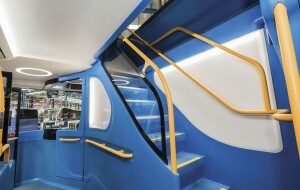 It has an enormous driver’s storage area within the door moulding and large Perspex ‘security’ screens. The white dash surround and blue dash moulding were somewhat vibrant for my liking but this is an aspect that will be chosen by the operator. All controls were directly within the driver’s eye line. 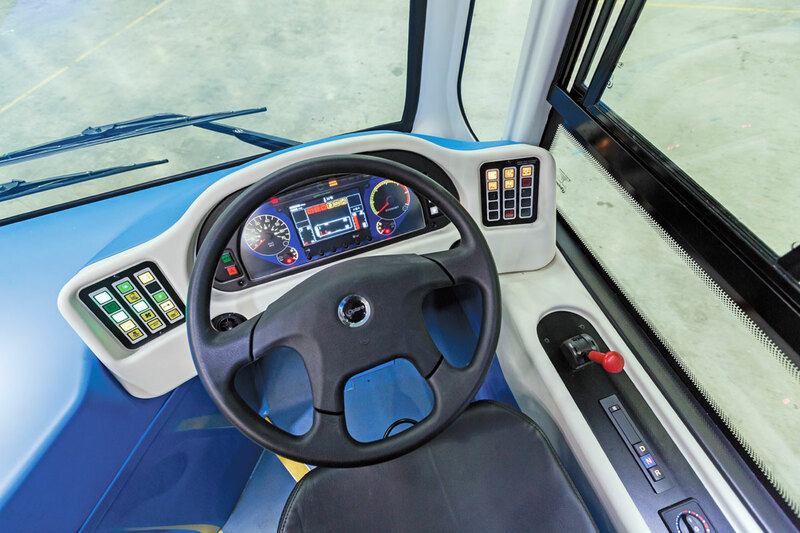 Behind the driver is a panel, behind which are the bus electrical systems, including those for the engine, electronic suspension, and the input/output units. Mounted within a moulding, the systems are not exposed to the front axle in any way. Throughout the bus all lighting employs LEDs, including the dip beam facility. 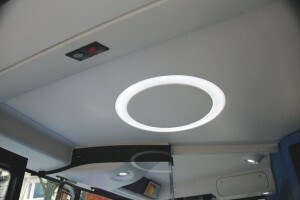 Optare have opted to make all interior lighting indirect where possible, one benefit of which is that it reduces glare. There were some nice touches, among them a circular down light over the main entrance and effective down-lighting in the stairwell. Illustrating Glenn’s points about avoiding redundancy, Tim Hampshire showed me that there was no steel within the top deck rear five seat. Instead, the seat was cemented to the plenum chamber for the heating system and the plenum chamber to the GRP. Similarly at the front; the lower half of the destination unit is mounted on the frame and the top half is linked to the GRP, so there is no need for a separate GRP frame. Only one engine option is offered, and in keeping with the industry wide downsizing trend it has a capacity of only 5.1-litres. This is the Mercedes-Benz OM934 four-cylinder Euro6 unit with SCR, EGR and twin VGT which develops 230bhp/170kW at 2,200rpm and peak torque of 900Nm at 1,200rpm. It is mounted transversely at the rear with an angle drive driving into the rear axle. 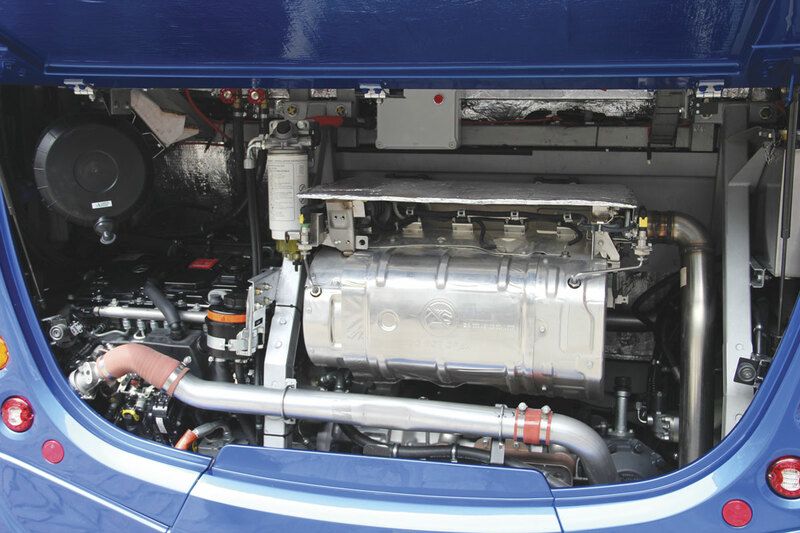 Optare has a longstanding relationship with Mercedes-Benz and offers its engines across the range. 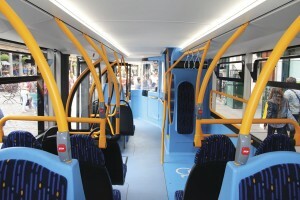 It will not have exclusivity in the double deck market because Wrightbus recently announced that it would also be using the OM934 in its integral double deck range. Only one gearbox option is offered; the six-speed ZF Ecolife 6AP1000B fully automatic three-button transmission with integral hydrodynamic retarder and angle drive into the rear axle. It features Topodyn adaptive and topographic shift control incorporating AIS for reduced load at idle. The gearbox is fully linked to the engine and other vehicle systems through a CAN interface. 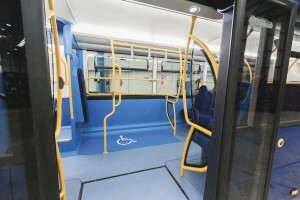 Following longstanding Optare practice, the main driveline components are mounted within a cradle at the rear that can easily be demounted if attention is required. This is a completely new cradle that is not interchangeable with other members of the current range. Removing eight bolts enable the cradle to be disconnected from the rest of the structure. Using the cradle technique assists Optare and the operator, not only in the servicing of the product, but also with the accommodation of future driveline developments that may be required to take account of technological advances. A change from previous Optare double deck practice is the use of the ZF AV132 portal axle at the rear with a 6.2:1 ratio. To ensure good ride characteristics, the four airbags have been moved out as far as they could be on wide track suspension beams. An anti roll bar, four Koni dampers and Knorr-Bremse SB7000 disc brakes are also fitted. At the front the ZF RL75EC fully independent suspension system is employed with two air bags, two Koni dampers and Knorr Bremse SN7 disc brakes. The lock angles are 53/42 degrees, which enables a wall to wall turning circle of under 10.1m, a kerb to kerb turning circle of 8.257m and a pull out distance of 1.25m. 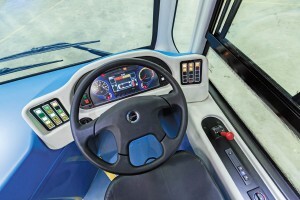 ZF’s 8098 integrally power assisted steering system is used and the steering column is pneumatically adjustable for tilt and reach with all of the usual controls on one multi function stalk. Braking employs a Knorr-Bremse dual circuit system. The air disc brakes have non-asbestos linings and there is an anti-lock braking system. The parking brake is a spring actuated air release unit acting on the rear wheels. The air dryer is the Knorr Bremse ZB44 APU and the air compressor is a 393cc Wabco, continuous duty, single cylinder unit. Actia’s latest Actimux fully multiplexed, centralised, electrical system is used, providing easy fault finding through a diagnostics facility. There is a dual battery arrangement, one set being solely dedicated to the starting of the bus. It is a 24 volt system with 2 x 12 volt 95Ah maintenance frees start batteries and 2 x 12 volt 55Ah deep cycle, maintenance free main vehicle batteries. Wheels are 22.5 x 8.25 x 153mm offset ten-stud units shod with Michelin 275/70R x 22.5 tubeless tyres. Glenn Saint said they would not be calling it a micro hybrid but the MetroDecker incorporated all the elements of the energy management system developed to achieve the low carbon certificate including management of the compressed air, the energy to the batteries and the fan drives.